Nestled on a secluded tree-lined avenue in the heart of lively Killarney, Windway House is an award-winning, family run home. 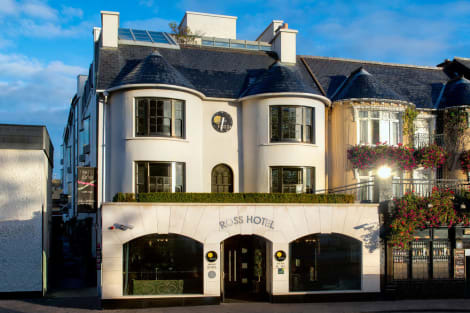 A three-minute stroll from the town centre, guests can enjoy comfort and exceptional County Kerry hospitality. With the stunning Killarney National Park, INEC entertainment venue, water sports and gourmet restaurants all nearby, visitors can sample the very best of Kerry’s renowned culture and attractions. Host Mary Ahern-Nolan offers a genuine Irish welcome. Grab a bite at Grand Pey, one of the hotel's 3 restaurants, or stay in and take advantage of the room service (during limited hours). Snacks are also available at the coffee shop/café. Wrap up your day with a drink at the bar/lounge. Buffet breakfasts are available daily for a fee. Stop by the hotel's restaurant, Cellar One, for dinner or brunch. Dining is also available at the coffee shop/café, and room service (during limited hours) is provided. Need to unwind? Take a break with a tasty beverage at one of the 2 bars/lounges. Buffet breakfasts are available daily from 7:30 AM to 10 AM for a fee. Satisfy your appetite for lunch or dinner at the hotel's restaurant, or stay in and take advantage of the room service (during limited hours). Quench your thirst with your favorite drink at the bar/lounge. A complimentary cooked-to-order breakfast is served daily from 8 AM to 10 AM. With a stay at Great Southern Killarney in Killarney, you'll be a 4-minute drive from INEC Killarney and 6 minutes from Ross Castle. This 4-star hotel is 3.6 mi (5.8 km) from Killarney National Park and 0.1 mi (0.2 km) from Killarney House Gardens. When you stay at Randles Hotel in Killarney, you'll be near the airport, within a 5-minute drive of INEC Killarney and Ross Castle. This 4-star hotel is 3.4 mi (5.6 km) from Killarney National Park and 0.2 mi (0.4 km) from Killarney Methodist Church. Need to unwind? Take a break with a tasty beverage at one of the 2 bars/lounges. A complimentary full breakfast is served daily from 8 AM to 10 AM.